These southwest-inspired, black-bean-stuffed sweet potatoes are as easy, healthy, and delicious as recipes come. 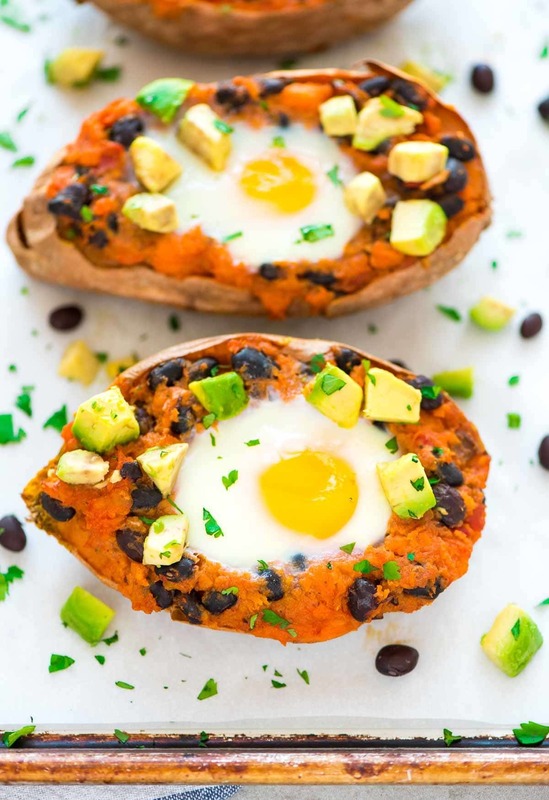 While I strive to make every recipe on this site reasonably simple to make and as appetizing as possible, these Mexican Stuffed Sweet Potatoes are especially appealing, even for someone who might not be used to eating a healthy diet. 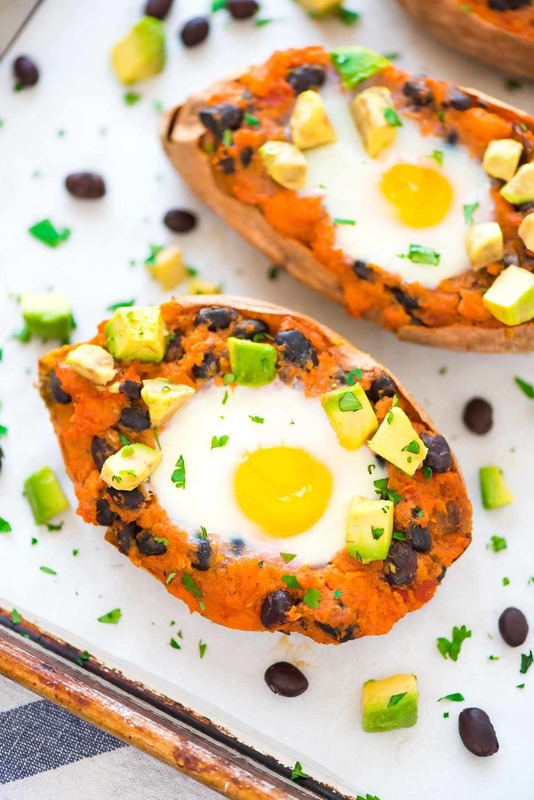 Whether you are looking to start a healthy-eating routine for the first time, on a post-holiday detox, or an old pro at this whole “healthy eating” biz, these savory stuffed sweet potatoes have something to offer. Mexican Stuffed Sweet Potatoes, let’s make the case. There are only 5 INGREDIENTS, most of which I’m betting you have in your pantry right now. Forget what you’ve heard—healthy cooking does not require a laundry list of ingredients or a trip to a specialty foods store. EASY RECIPE ALERT. You could make these Mexican Stuffed Sweet Potatoes in your sleep, while standing on one foot, and watching an episode of New Girl all at the same time. One and done. These Mexican Stuffed Sweet Potatoes offer servings of veggies, lean proteins, and healthy fats in one single powerhouse dish. Serves 1. Or 100. One of the biggest challenges to healthy eating I hear is that it’s challenging to cook healthy as a single person. With this recipe, you can bake as many or as few sweet potato boats as you need. They are YUMMY. No one said healthy food had to be boring. The five-star ingredients in this Mexican Stuffed Sweet Potato recipe are salsa (¡olé! ), black beans (protein! 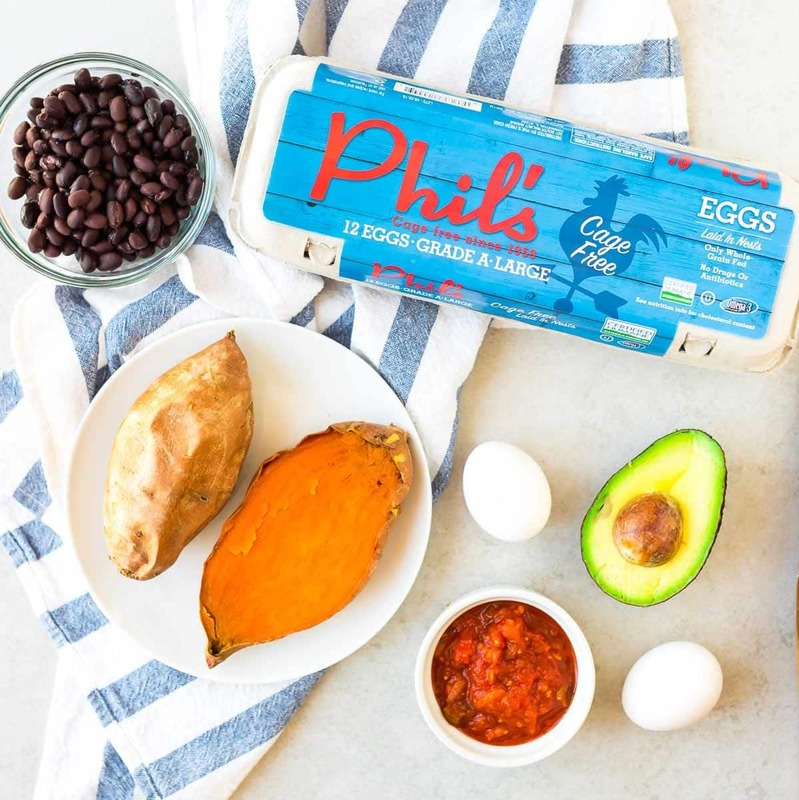 ), sweet potatoes (hello, vitamin-rich, tasty vegetable), avocado (super food alert), and Phil’s Fresh Eggs, a family-owned company that I’m partnering with this year to create a series of monthly recipes. Phil’s still raises its chickens on its original family farm and has offered cage-free eggs from humanely raised hens since 1959, way before it was the cool thing to do. Personally, I’m happy to see consumers becoming more conscious about their food sources, including eggs. I’ve also noticed the taste and quality of cage-free eggs to be outstanding—even the yolks are brighter! 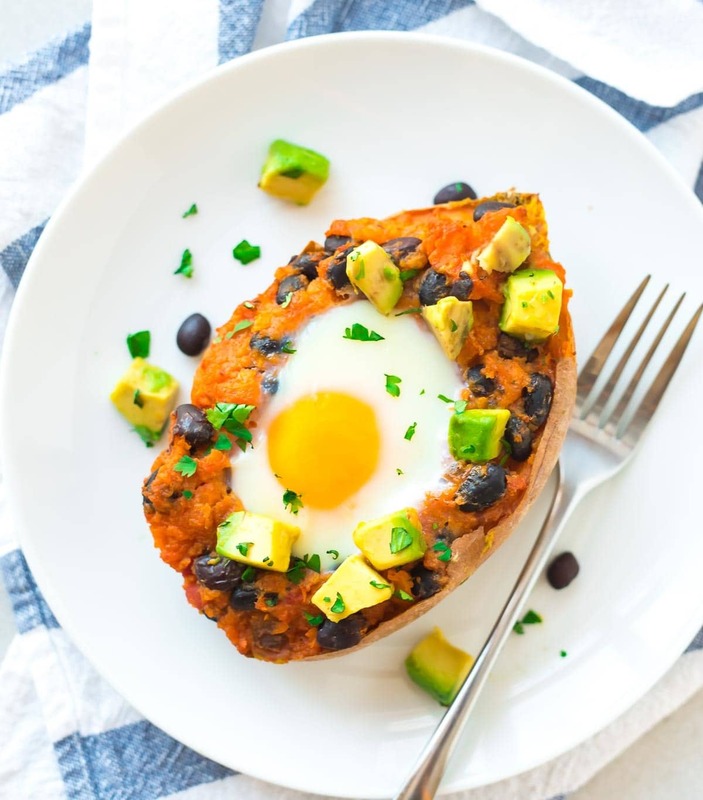 Although I’ve suggested stuffing the sweet potatoes with salsa, black beans, eggs, and avocado, feel free to take this recipe beyond the five ingredients to fit your own tastes or what you have on hand. They’re great with cheese (of course), Greek yogurt (my swap for sour cream), and even sautéed spinach for an extra hit of green. These savory Mexican Stuffed Sweet Potatoes might be on Page 1 for January, but I hope that you refer to them all year long. Anytime you need an easy, healthy dinner fix, just flip right here. This recipe has you covered! 5 Ingredient Mexican Stuffed Sweet Potatoes with black beans, avocado and salsa. An easy, healthy, delicious recipe. Great for quick lunches and dinners! Preheat the oven to 400 degrees F. Scrub the potatoes (do not peel or pierce) and arrange in a single layer on an ungreased baking sheet. Bake until the potatoes are tender, 50-60 minutes, depending upon the size of your potatoes. Set aside until cool enough to handle. Slice the potatoes in half lengthwise, then carefully scoop the insides into a mixing bowl, leaving a 1/4-inch-thick border on all sides and the bottom. Add the beans and salsa to the mixing bowl, then mix to combine. Stuff the filling back into the sweet potatoes, diving evenly among the potato halves. Make a well in the center of each for the egg. To ensure even egg cooking, make sure the well is as wide (or even a bit wider) as it is deep. Crack one egg inside each well, then bake for 10-15 minutes, until the egg is just set (the deeper and narrower the well, the longer the eggs will take to cook; the wider the well, the faster). Serve immediately, topped with avocado and any other desired toppings. Ain’t that the cutest little egg plopped on top? Would really like to be able to order something like this from a restaurant. Genius! My breakfast and brunch game need a makeover. So making!! This recipe would be perfect for that! Thanks, Lauren! How cauuteeee are these sweet potato boats! I LOVE all things mexican flavor, so I’m sure I’d love these sweet taters! 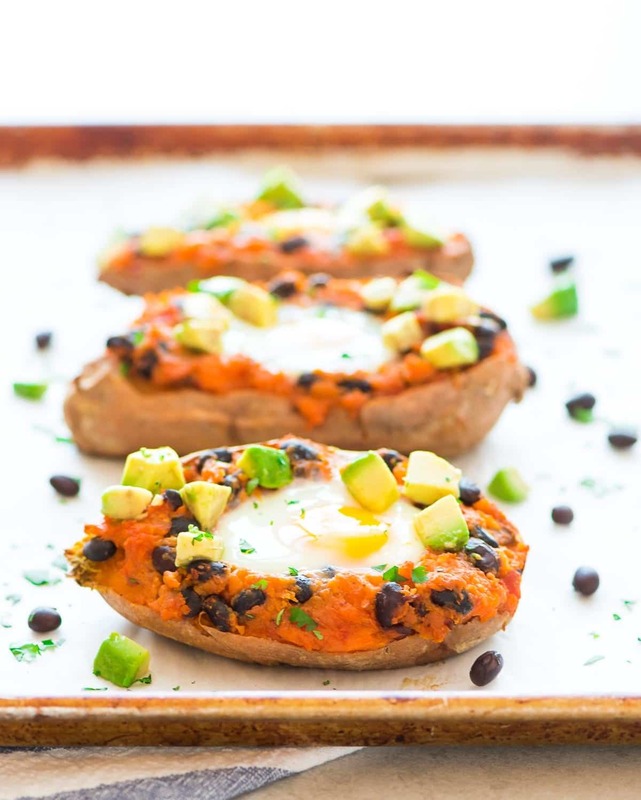 These sound really good – my husband isn’t a sweet potato fan but I’ll make this when I make him something I don’t particularly care for. Sounds like a plan to me! Off subject – I did get the new Mario Batali cookbook for Christmas. A really beautiful cookbook and I’ve tried only 1 recipe so far. The Tortilla Soup is the best I’ve ever had and certainly doesn’t seem unhealthy as far as the ingredients go. Can’t wait to try more…most of the recipes have pictures which I like alot. Great plan, Chris! I hope you enjoy these. And thanks for sharing about the Mario Batali cookbook! I’ll have to check it out. Sounds and looks wonderful and yes I do have have all the ingredients on hand. Definitely going to try this. AWESOME Peggy. I’m so glad to hear it. Thanks for leaving this nice review! Tried this recipe yesterday when my son came to dinner. As a single guy, he spends most of his time eating out and most times not healthily. Want him to try more meatless meals. He absolutely loved the taste and the interesting combination of flavors. This dish was hearty enough for him. He especially liked the egg topping! Hi Susan! I’m so glad the recipe was a hit for the whole family! The egg on top is one of my favorite parts too. :) Thank you so much for taking the time to leave this wonderful review! It really means a lot. Yum! My crew enjoyed this as a good way to mix up our usual weeknight dinner. The component parts were all on my list of regular menu items for my 9 month old, so even he could enjoy it. If, however, you are not a master egg-hole-maker, learn from my mistake. The overflow of egg whites onto my pan, plus the oh-so-yummy sweet potato “molasses” from the second round of baking were difficult to scrub from my pan. Use tin foil, a Silpat, or parchment, like Erin’s pictures show, to save you a lot of scrubbing! Or maybe next time I’ll just fry the eggs on the stove to avoid my anxiety about my questionable egg baking skills, while I warm the stuffed boats in the oven. Hi Elizabeth! I’m so happy you and your family enjoyed the recipe! Thanks for sharing your hard-won advice, and I think frying the egg separately is another good idea if you’re concerned about it not staying contained in your sweet potato boat. I appreciate your taking the time to leave this great review! Oh no Melissa! Next time I’d suggest making the well a little larger. That should solve the problem. I hope it was still delicious! These were very good! I was skeptical about the egg and over cooked it because it was hard to tell if it was cooked enough because it stays really glossy. I finally poked the egg white with a toothpick to find that it was way done lol! Ended up with a tough skin on top that I just peeled off. Oh well, now I know what to expect next time. And there will be a next time! Thanks for the recipe! Toni, thanks for taking the time to review the recipe! I’m glad you enjoyed it!